Ufford Park: the summer holidays’ best kept Suffolk secret! Stuck for something fun to do during the summer holidays that will keep all the kids – and the parents – happy too? Then why not check out Ufford Park Hotel Golf and Spa, near Woodbridge, Suffolk? Open to everyone, not just hotel guests, you can comfortably spend a whole day here, without having to worry about parking or how to keep everybody happy, because there’s something for everyone, whatever the weather and whoever you are! with spacious gym and indoor swimming pool; contemporary thermal suite spa and beauty salon; and The Park Restaurant and Bar. Congo Rapids Adventure Golf, Swim and Lunch offer! 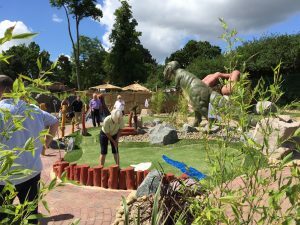 Our Congo Rapids Adventure Golf course is a wonderland of challenges and fun and a great way to keep you all entertained and happy for a morning or afternoon. The course is based on the kind of adventure golf courses popular in Florida, USA and your journey begins by pulling yourself across one of our water lagoons using a small boat before encountering a lost plane crash site in the jungle, not to mention the cannibal cooking pot! If that sounds right up your street, then we’ve got a great offer which runs through the school holidays and beyond. 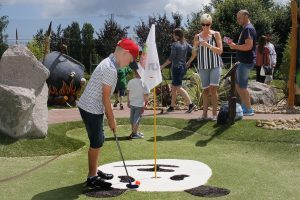 For just £15.00 per child age 4 to 12 years old, you get a game of adventure golf, a swim in our indoor pool and a main meal from the children’s menu. We also have a family package from £45.00, to help you spread the load, so there’s really no excuse to stay at home! 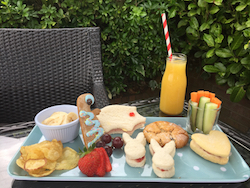 Everything stops for tea so the song goes, and here at Ufford Park we have a selection of afternoon teas to tempt the tastebuds of the whole family! Served daily between 2 and 5 pm, we offer a sweet or savoury menu from £16.95 per person, as well as a Children’s Afternoon Tea menu which features a choice of sandwiches and a selection of delicious treats for just £9.95. We can serve your special tea in either The Park Bar or The Aldous Lounge, overlooking our terrace and our sweeping landscaped golf course, and if you have a special occasion in mind, just let us know and we’ll arrange everything! If you’re looking to have a family lunch during the school holidays, don’t forget we’ve got The Park Bar, serving light bites, a children’s menu and delicious bar snacks, alongside locally famous Paddy & Scott’s coffees, home- made cakes, all served in a relaxing atmosphere with friendly staff and great views. If you’re looking for dinner, The Park Restaurant is open from 6.30 pm to 9.30 pm Mondays to Saturdays and until 9 pm on Sundays. All our menus serve locally sourced food, with a seasonally changing menu and a wonderful three-course Sunday lunch. For more information about these and all our offers, please see our website www.uffordpark.co.uk, follow us on Facebook or contact us on 01394 383555 and speak to one of our helpful team, who will do their best to help you.